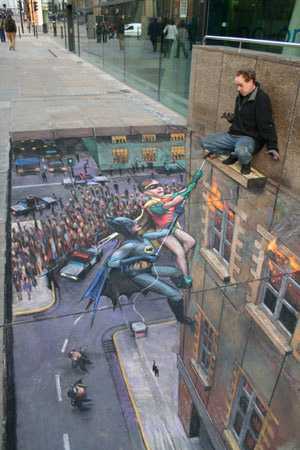 Julian Beever is an artist who has spent 10 years creating pavement art in Europe, USA and Australia. Many of his creations are optical illusions, such as this one, where Julian appears to be perched on a ledge, waiting for Batman and Robin to climb the building and rescue him. In reality, there is just pavement in front of him, and the street below together with the expectant crowd, plus the blazing building below him, are all tricks played on the eye (a modern example of trompe l’oeil – a French term that means literally ‘trick the eye’). While many of his pictures can take a whole day to create, by the next day they are often gone, vanished under the feet of passing pedestrians. It is a very evanescent art form, one that lives mostly through photographs taken at the time. Maurits Cornelis Escher (June 17, 1898 – March 27, 1972), usually referred to as M. C. Escher, was a Dutch graphic artist. 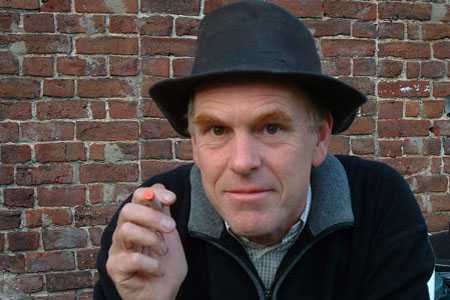 He is known for his often mathematically inspired woodcuts, lithographs and mezzotints. These feature impossible constructions, explorations of infinity, architecture and tessellations. Maurits Cornelis, or “Mauk” as he came to be nicknamed, was born in Leeuarden, The Netherlands. He was the youngest son of civil engineer George Arnold Escher and his second wife, Sara Gleichman. He was a sickly child, and was placed in a special school at the age of seven and failed the second grade. In 1903, the family moved to Arnhem where he took carpentry and piano lessons until he was thirteen years old. From 1903 until 1918 he attended primary and secondary school. Though he excelled at drawing, his grades were generally poor. In 1919, Escher attended the Haarlem School of Architecture and Decorative Arts. He briefly studied architecture, but failed a number of subjects (partly due to a persistent skin infection) and switched to decorative arts. Here he studied under Samuel Jessurun de Mesquita, with whom he would remain friends for years. In 1922 Escher left the school, having gained experience in drawing and making woodcuts. In 1922, an important year in his life, Escher traveled through Italy (Florence, San Gimignano, Volterra, Siena) and Spain (Madrid, Toledo, Granada). He was impressed by the Italian countryside and by the Alhambra, a fourteenth-century Moorish castle in Granada, Spain. He came back to Italy regularly in the following years. In Italy he met Jetta Umiker, whom he married in 1924. The young couple settled down in Rome and stayed there until 1935, when the political climate under Mussolini became unbearable. Their son, Giorgio Arnaldo Escher, named after his grandfather, was born in Rome. The family next moved to Château-d’Œx, Switzerland where they remained for two years. Escher, who had been very fond of and inspired by the landscape in Italy, was decidedly unhappy in Switzerland, so in 1937, the family moved again, to Ukkel, a small town near Brussels, Belgium. World War II forced them to move in January 1941, this time to Baarn, the Netherlands, where Escher lived until 1970. 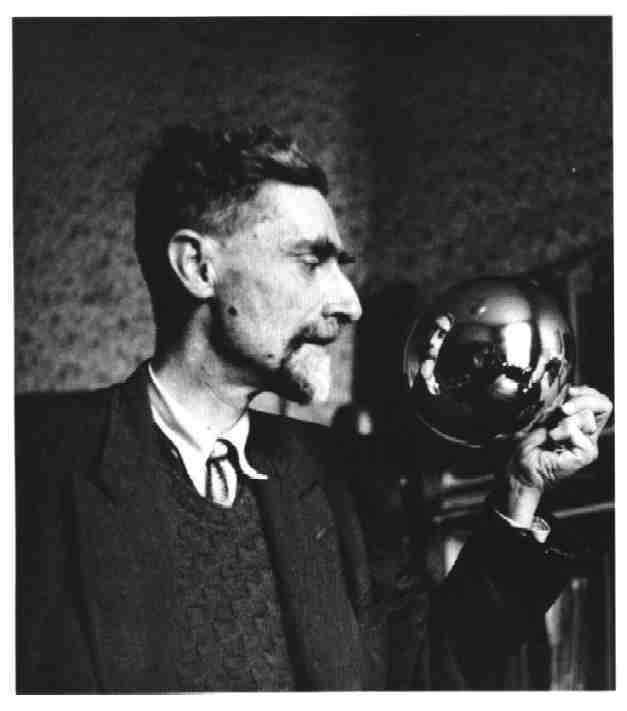 Most of Escher’s better-known pictures date from this period. The sometimes cloudy, cold, wet weather of the Netherlands allowed him to focus intently on his works, and only during 1962, when he underwent surgery, was there a time when no new images were created. On April 30, 1955, Escher was awarded a Knighthood of the Order of Orange-Nassau. Escher moved to the Rosa-Spier house in Laren in 1970, a retirement home for artists where he had his own studio. He died at the home on March 27, 1972, at 73 years of age. Escher’s first print of an impossible reality was Still Life and Street, 1937. His artistic expression was created from images in his mind, rather than directly from observations and travels to other countries. Well known examples of his work also include Drawing Hands, a work in which two hands are shown, each drawing the other; Sky and Water, in which light plays on shadow to morph fish in water into birds in the sky; Ascending and Descending, in which lines of people ascend and descend stairs in an infinite loop, on a construction which is impossible to build and possible to draw only by taking advantage of quirks of perception and perspective. He worked primarily in the media of lithographs and woodcuts, though the few mezzotints he made are considered to be masterpieces of the technique. In his graphic art, he portrayed mathematical relationships among shapes, figures and space. Additionally, he explored interlocking figures using black and white to enhance different dimensions. Integrated into his prints were mirror images of cones, spheres, cubes, rings and spirals. In addition to sketching landscape and nature in his early years, he also sketched insects, which frequently appeared in his later work. His first artistic work was completed in 1922, which featured eight human heads divided in different planes. Later in about 1924, he lost interest in “regular division” of planes, and turned to sketching landscapes in Italy with irregular perspectives that are impossible in natural form. Although Escher did not have a mathematical training—his understanding of mathematics was largely visual and intuitive—Escher’s work has a strong mathematical component, and more than a few of the worlds which he drew are built around impossible objects such as the Necker cube and the Penrose triangle. Many of Escher’s works employed repeated tilings called tessellations. Escher’s artwork is especially well-liked by mathematicians and scientists, who enjoy his use of polyhedra and geometric distortions. For example, in Gravity, multi-colored turtles poke their heads out of a stellated dodecahedron. After his journey to the Alhambra, Escher tried to improve upon the art works of the Moors using geometric grids as the basis for his sketches, which he then overlaid with additional designs, mainly animals such as birds and lions. His first study of mathematics, which would later lead to its incorporation into his art works, began with George Pólya’s academic paper on plane symmetry groups sent to him by his brother Berend. This paper inspired him to learn the concept of the 17 wallpaper groups (plane symmetry groups). Utilizing this mathematical concept, Escher created periodic tilings with 43 colored drawings of different types of symmetry. From this point on he developed a mathematical approach to expressions of symmetry in his art works. Starting in 1937, he created woodcuts using the concept of the 17 plane symmetry groups. In 1941, Escher wrote his first paper, now publicly recognized, called Regular Division of the Plane with Asymmetric Congruent Polygons, which detailed his mathematical approach to artwork creation. His intention in writing this was to aid himself in integrating mathematics into art. Escher is considered a research mathematician of his time because of his documentation with this paper. In it, he studied color based division, and developed a system of categorizing combinations of shape, color and symmetrical properties. By studying these areas, he explored an area that later mathematicians labeled crystallography. His works brought him fame: he was awarded the Knighthood of the Order of Orange Nassau in 1955. Subsequently he regularly designed art for dignitaries around the world. Escher also studied the mathematical concepts of topology. He learned additional concepts in mathematics from British mathematician Roger Penrose. From this knowledge he created Waterfall and Up and Down, featuring irregular perspectives similar to the concept of the Möbius strip. Escher printed Metamorphosis I in 1937, which was a beginning part of a series of designs that told a story through the use of pictures. 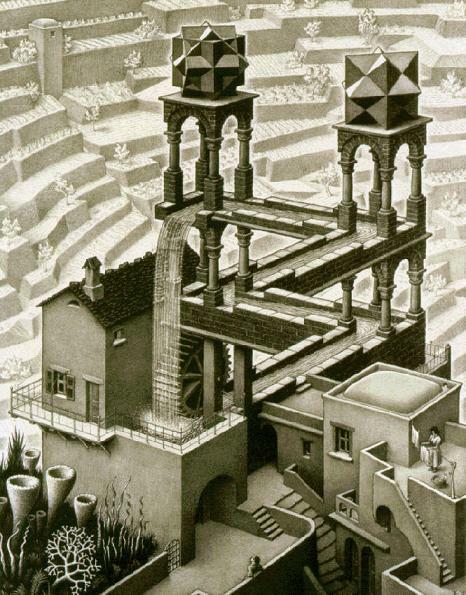 These works demonstrated a culmination of Escher’s skills to incorporate mathematics into art. In Metamorphosis I, he transformed convex polygons into regular patterns in a plane to form a human motif. This effect symbolizes his change of interest from landscape and nature to regular division of a plane. One of his most notable works is the piece Metamorphosis III, which is wide enough to cover all the walls in a room, and then loop back onto itself. After 1953, Escher became a lecturer to many organizations. A planned series of lectures in North America in 1962 was cancelled due to illness, but the illustrations and text for the lectures, written out in full by Escher, was later published as part of the book Escher on Escher. In July of 1969, he finished his last work before his death, a woodcut called Snakes. It features etchings of patterns that fade to infinity both to the center and the edge of a circle. Snakes transverse the circle and the patterns in it, with their heads sticking out of the circle. Many well known museums include original works by Escher in their collections. Some leading public collections include the following: The National Gallery of Art in Washington, D.C., The National Gallery of Canada in Ottawa, The Israel Museum in Jerusalem, The Escher Museum at The Hague, The Netherlands, and the Fine Arts Museums of San Francisco. 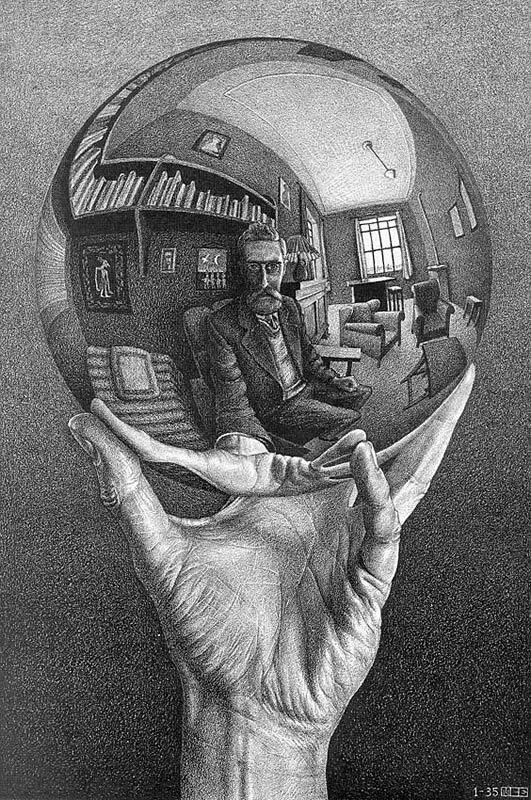 Escher’s work appears in many of the finest private collections including the Schwartz Collection of Boston, the Walker Collection of San Diego, the Vess Collection of Detroit, the Roosevelt Collection of Palm Beach, the Price Collection of Connecticut, and the Elder Collection of San Francisco.